We begin the series looking at the Jets performance in special teams situations, next up with forwards on the penalty kill. There were some concerns about the loss of Michael Frolik and Evander Kane, and what it means for the Jets penalty kill. Luckily, the Jets have the return of Alexander Burmistrov, who has been superior in suppressing shots and chances against. The Jets are also losing Jim Slater who –despite excellent faceoff results– is one of the worst penalty killers in the NHL, allowing the 15th most non-blocked shot attempts (FA/60) of the 116 forwards to play 300+ minutes between 2011-2015. A team’s shots attempt differential per 60 minutes (Corsi) has historically provided the strongest relationship with a team’s future goal suppression performance on the penalty kill. The inclusion of shot attempts improving the model could be chance or could be because it is detecting players and systems that push the play to the opposition, gaining potential offensive zone starts and line changes. Adam Lowry has performed exceptionally well on the penalty kill, although a large chunk of his ice time comes from offensive zone starts, starting about one of every three non-neutral zone, short-handed shifts in the offensive zone. Blake Wheeler and Alex Burmistrov have both performed exceptionally well in both suppression and generating offense on the penalty kill. The next tier has Andrew Ladd, Bryan Little, and Matt Halischuk. Halischuk has allowed more non-blocked shot attempts than Ladd or Little, but his scoring chances against (SCA/60) is comparative. Drew Stafford’s numbers leave a lot to be desired, but there is the possibility that the terrible Buffalo Sabres have significantly altered these numbers. Chris Thorburn’s numbers are interesting to study. His shot attempt differential, non-blocked shot attempts rate against, and goal rate against are terrible; however, he performs fairly well in scoring chances. 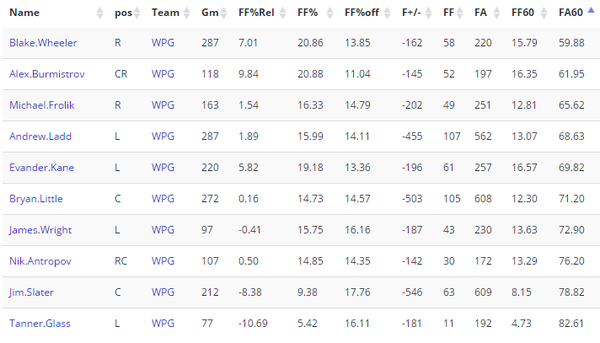 It is most likely though that the first numbers are the better describers of Thorburn’s true-talent and impact level. The Jets will likely run three pairs of forwards throughout the season, with Ladd and Little being the third pair to save them for the power play and even strength. Lowry and Burmistrov offer two potent options for the other two centres, One would then be paired with Wheeler. The other though may struggle depending on their partner. Halischuk could end up in the pressbox or the Manitoba Moose, and there is no certainty how Stafford will perform in Winnipeg. Overall, the Jets have most of their best performers on the penalty kill still around. Their previous struggles on the penalty kill could be isolated to poor goaltending plus Jim Slater and whomever was paired with Slater. All numbers courtesy of War on Ice. Playoff Thumbs Up, Thumbs Down: Jets On the Board!